School meals are provided and cooked on site. Alternatively, pupils may bring sandwiches. Pupils from Reception to Year 6 are served on a ‘self-service’ basis. All children are supervised by supervisory assistants. The Under 5's are supervised by Support Staff. Darperir cinio i'r plant ar y safle ond caniateir iddynt ddod a brechdanau os dymunir. Byddant yn cael eu gwarchod yn ystod yr awr ginio gan y ddwy Weinyddes Feithrin a'r Menywod Cinio. We operate a cashless payment system, giving parents the ability to pay online via the Bridgend County Borough Council’s ‘Pay It’ link. The login details for your child will be given to you in September by Miss Jones. Milk: All Infants are eligible for free school milk . Fruit: Pupils can bring their own fruit to school or can pay 30p per day for fruit from school. Please send any fruit money into school in your child’s bag. Please ensure it is in an envelope clearly marked with their name. 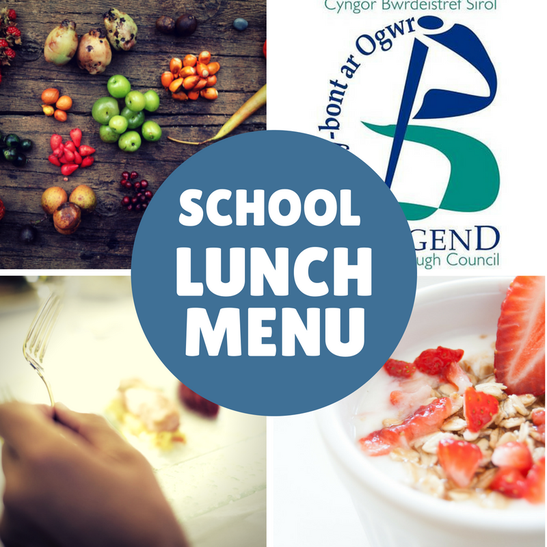 Our menu has been analysed and are fully compliant with the Welsh Government’s Healthy Eating in Schools (Nutritional Standards and Requirements) (Wales) Regulations. For just £2.20 per day, pupils receive a main meal, dessert and a cold drink of semi-skimmed milk or water. Nursery pupils are served a single menu which is indicated on the menu by an asterix*. Our menu is run on a 3-week rotational cycle ensuring variety and choice with a strong focus on fresh fruit, vegetables and salads. Good practice ensures all foods are oven baked or steamed, except chips which are served only once a week on a Friday. Also available daily; fresh fruit, wholemeal bread, yoghurt, cheese & biscuits, ice cream, semi-skimmed milk and water.